Perhaps the biggest change is the ability for developers to charge for applications. This is provided via integration with PayPal, and currently available for U.S. customers. Full details on the payment system can be found in this press release. 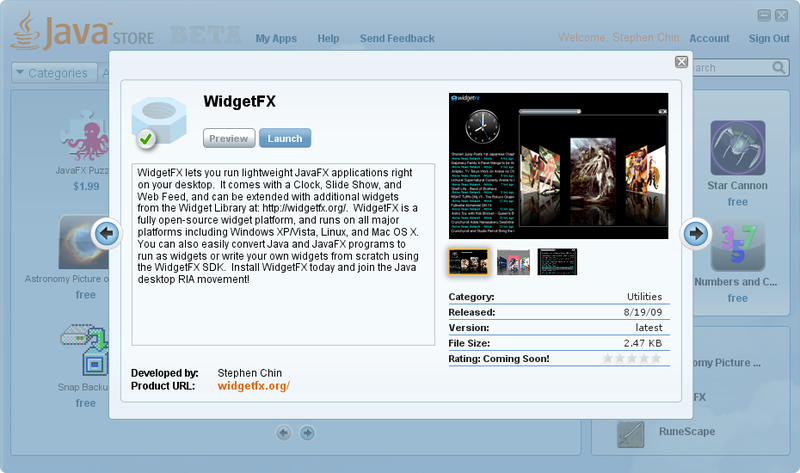 Of course, the best applications are available for free… Be sure to try launching WidgetFX from the Java Store and let me know how it works! Congratulations to the JavaFX team on a very nice face lift for the Java Store! I know that many of the Java Store development team members read this blog, including Joshua Marinacci, so feel free to use the comments section to give them constructive feedback. WidgetFX 1.2.4 Released – Happy Halloween! 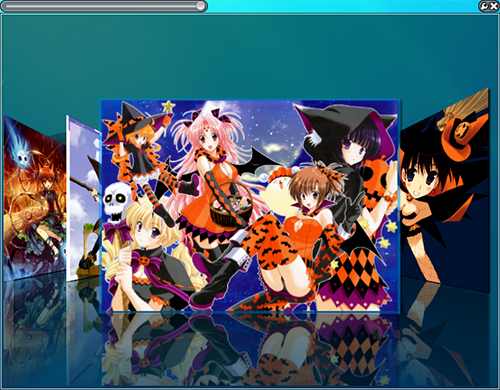 We have an early Halloween treat from the WidgetFX team… a new software release! The 1.2.4 version of WidgetFX includes some new functionality and fixes a number of issues that our user community has requested. The SlideShow widget was completely rewritten from scratch for this release. It makes use of the pre-release JFXtras XShelf component for transitions and paging forward and back. Simply click on the side images to scroll forwards and backwards through your library. Happy Halloween from the WidgetFX Team! If you are enough of an Anime buff to know which series these pictures came from, be sure to leave a comment below! The link that gets created to restart WidgetFX now picks up the correct JVM version on 64-bit systems and even handles paths properly for non-US versions of Windows. This is very important for our friends outsides the US, such as the growing Japanese WidgetFX community. As an example, check out this translated Japanese article in @IT by long-time WidgetFX developer, Hideki Kobayashi (he is also responsible for the Japanese location of our website). If you have trouble running WidgetFX on a 64-bit system, make sure you have the 32-bit JVM installed on your machine. 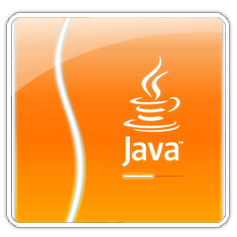 This can be installed side-by-side with a 64-bit JVM, and is required for JavaFX applications to run. 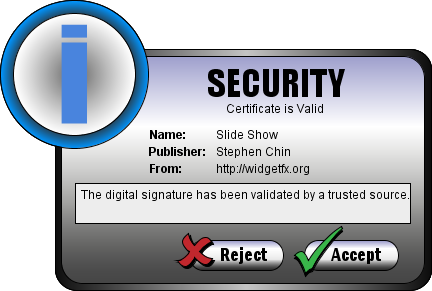 Our application signing certificate expired, producing warnings upon launch of WidgetFX. We have generated a new certificate, which should be good for another year. If you noticed any problems with launching WidgetFX this week, please try again. We ran into a Webstart bug where it did not correctly update the jar file after the certificate upgrade causing a verification error on start-up. We were able to fix this by doing nothing but revving the version (missing some great opportunities for bad puns on the intermediate 1.2.3 version number). We are always fixing small bugs or issues as they come up. One in particular was an infinite loop during start-up caused by some specific network settings. 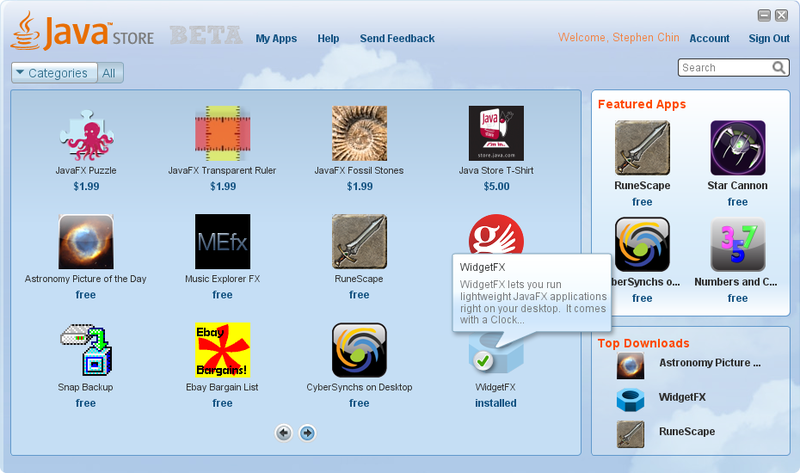 If you notice any issues with WidgetFX, let us know so we can make it better! To try any of the contest entries below, simply click on the image which will install/open WidgetFX and add the widget to your dock. Pär has a great blog on JavaFX, WidgetFX, and other topics of interest, so make sure to check out his contest winning speech. Second place went to Yannick Van Godtsenhoven for his RadioFX Widget. In terms of visual design and widget polish, Yannick was head-and-shoulders above the competition. He built a simple, yet functional widget that streams radio over the internet right to your WidgetFX dock. No more reaching for a web browser to catch your favorite Belgium tunes on StuBru! 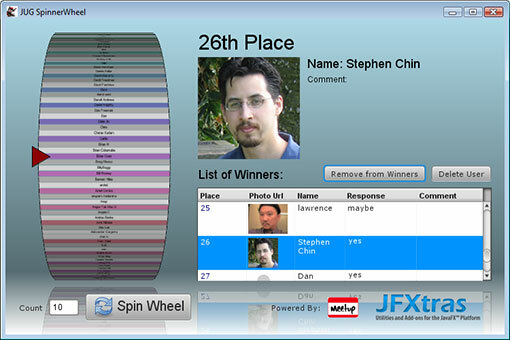 Check out Yannick’s blog to hear about the contest results and his experience with JavaFX. I am definitely looking forward to more great creations from Yannick! Finally, third place went to Larry Dickson for his Infix WeatherWidget. Besides his Weather widget, he also submitted 3 other widgets including a Clock, Calendar, and G-Mail widget, although his original creation was still the judges’ favorite. By the way, Larry submitted this widget before the start of the contest, which was perfectly valid. Similarly, if you submit a widget anytime between now and the start of our next contest you will automatically be entered to win! Congratulations to all of our winners!!! I have already sent them their prizes, which were contributed through a generous donation from my publisher, Apress. Effective use of WidgetFX features and APIs. Practical utility of the widget as a pervasive prescence on the user’s desktop. Broad use of JavaFX libraries and APIs. Community features of the widget that tie in with social networking or online services. Originality of the submitted widget. Quality of widget functionality and dock integration. Good luck with the contest, and thanks for supporting WidgetFX! I am pleased to announce the 1.2 release of the WidgetFX project. This brings the project up to speed with the latest JavaFX 1.2 release, and includes many bugfixes and improvements to the framework. I want to thank all the widget authors who made an extra effort to port their widgets during the beta period so they would be available from day 1 on the new version. So what are you running in your dock? Improved Performance – The widget dock, as well as all widgets will benefit from performance improvements in JavaFX 1.2. Additional API Hooks – New event handlers for onShow and onHide. Macintosh Bugfixes – Transparency now works with the latest JDK (1.6.0_13), and dialog interaction issues have been fixed. You too can be a widget author and win some free prizes in our widget development contest. The deadline is July 31st with a grand prize of a year’s worth of free books donated by my publisher, Apress.